Watch video interview of Iraq war vet on long solo Memorial Day walk with PTSD dog. 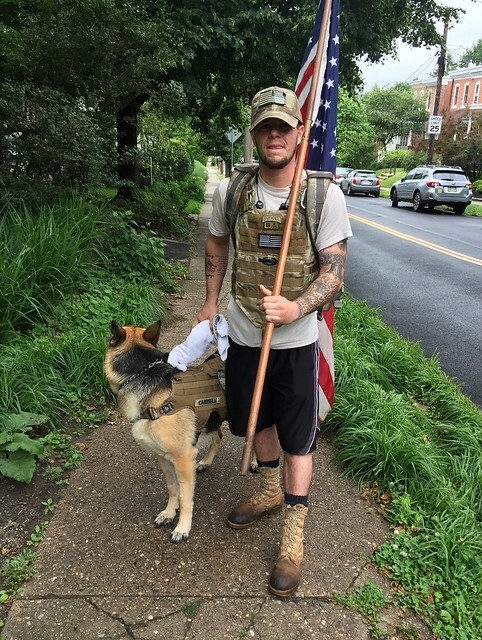 On Memorial Day, Iraq war vet Bobby Caroselli, gears up and takes a trek to commemorate his 28 fallen battalion comrades until he can walk no further. One arm and shoulder cradle the pole upon which a large American flag is hoisted while the other hand firmly holds the harness of his PTSD German Shepherd, "Corporal." He is outfitted in a camouflage flak vest, as is his dog, and his backpack bears the names of his fallen mates. He served in the army infantry during the 2007 surge and, only 19 at the time, he says he grew up fast. When asked about his combat experience he relates only that he had "seen enough." He remembers his buddies fondly and, recalling their humor and imaginative pranks, a smile comes over his face. Your correspondent struck up a conversation with Caroselli after he had paused near the war memorial atop the Water Tower Recreation Center fields. He and Corporal then resumed their solitary Memorial day march under gray, drizzly skies, the red and white striped flag flapping and snapping smartly behind.